Brazil: The Land of the Future? It was a moment of hope when I was growing up in Brazil. Although the country has always suffered from corruption and violence, the 1988 constitution was born out of a democratic process. Since 1964 Brazil had been under a military dictatorship, a ‘regime of exception’, in which individual and social rights were restricted and even ignored. The country was governed in the interests of the ruling dictatorship justified by the need to maintain national security. But a desire for change grew among the population who fought for a new constitution. Independent of the political controversies, the Federal Constitution of 1988 secured the fundamental human rights of all Brazilians. “We have peace; We have time; It’s time and now it’s here”. Since President Dilma Rousseff was impeached by the corruption-tainted Senate in 2016, the number of murders in the Amazon has been increasing exponentially. Land-grabbing, deforestation and environmental change have led to increasing levels of violence, criminalization, the repression of environmental defenders, and social instability. In 2017, there have already been 62 murders of environmental defenders. The conflicts, evictions and clashes are mainly caused by the increasing competition over the natural resources of land, minerals and forests. Recent years have seen the increasing power of groups linked to agribusiness and parliamentarians financed by the arms industry, along with the destruction of the national indigenous peoples’ foundation, FUNAI, through budget cuts and pressure from the ranchers’ lobby in Congress. The link between the dominion of the agribusiness group in the government and the growth of violence in the Amazon is clear. There is a direct connection between land grabbing, deforestation, and the treating of many workers as slaves. President Temer, who has been in power since 2016, has issued constitutional amendments, decrees and bills that not only threaten existing conservation efforts and Brazil’s climate targets, but perhaps more importantly, also threaten the rights of indigenous people, quilombolas, smallholders, rubber tappers and environmental defenders. Corruption and economic interests backed by the same argument of national security are the major forces of the deforestation, impunity and the non-realisation of rights that blight Brazil. Measures such as the possible opening up of the Renca reserve for mining, the paralyzation of the demarcation of indigenous lands through the ‘marco temporal’ 1988 deadline, the possible modifications on the environmental licensing process to allow the faster approval of large scale projects, the changes made at the national Terra Legal program to offer an amnesty to illegal land grabbers, the promotion of commodity waterways and railways backed by Chinese and European financing and engineering clearly show that we are selling out the Amazon. But at which price? The failure to meet the voluntary targets assumed under the Paris Agreement will have consequences far beyond Brazil’s borders as the Amazon forest is a major regulator of global climate. And the increasing rates of deforestation will release large amount of carbon from climate-related forest dieback. Even more important than halting the damaging initiatives of Temer is addressing the underlying global causes of the growing exploitation of Brazil’s natural resources: consumerism, population growth and the the increasing appetite for development. These are all directed linked to the way we perceive our remaining forest resources. At this moment, the world’s largest rainforest is turning to ashes. And those who are trying to defend it are the peoples who do not see the forests as their property, but as their lives. And the future? The future is now and it smells like a burned forest marked by innocent blood. United States bans fresh meat imports from Brazil! To (m)eat or not to (m)eat: What is at steak? Brazil has recently emerged as one of the world’s primary sources of meat, with expanding cattle ranches and intensified swine and chicken operations. Since 1990 beef production in Brazil has more than doubled (104% increase) and the country is now the world’s second largest meat producer (after the United States) and is tied with India as primary exporter. Hong Kong, China, Russia, Egypt, United States and the United Kingdom are Brazil’s principal meat trading partners. Ranchers expect that Brazil will soon outstrip the United States in production. But what is “at steak”? Land-use, land-use change and forestry (LULUCF) represents as much as 65% of Brazil’s total greenhouse gas (GHG) emissions, and the Amazon forest – the largest remaining tropical forest in the world – accounts for around two-thirds of LULUCF emissions. Much of the deforestation in the country stems from the promotion of private livestock production. Besides being one of the main drivers of deforestation, cattle ranching is also a major source of methane emissions, contributing to global climate change. More than 40% of Brazil’s beef cattle are raised in the Amazon and around two thirds of deforested areas in the biome were converted to pasture between 2004 and 2014. “Weak Flesh”, a two-year federal police investigation currently underway in Brazil, dramatized the corruption and unsanitary conditions that permeate meat supply chains, endangering human health both in Brazil and worldwide. The investigation found that Brazil’s largest meatpackers – JBS and BRF, which are both publicly traded global corporations – and other companies had bribed inspectors to permit rotten and contaminated meat to be exported or sold in-country for school lunches. Dozens of federal inspectors were arrested, accused of having ignored the adulteration or expiration of processed foods and of falsifying sanitary permits. JBS is one of the world’s largest meat producers, having expanded its foreign holdings recently to include the United States chicken processor Pilgrim’s Pride, Argentina’s Swift/Armour and Canadian ranches. BRF is a major meat exporter to the Middle East and Asia. JBS alone is responsible for around 60% of animals slaughtered in the Amazon. Crop production accounts for a considerably smaller share of the deforested area, since it usually occupies already deforested land, while cattle ranching tends to encroach directly on forest areas. Although deforestation had declined from 2010 to 2015 due to a combination of stronger enforcement and lower commodity prices, recent figures show an upswing of 26%. This presages a worsening of the driving forces behind Brazil’s continued rainforest destruction attributed in large measure to the livestock industry. Despite legally-enforced ‘zero deforestation agreements’ signed by the largest meatpacking enterprises in 2009, beef exporters continued to accept cattle from illegally deforested areas. Under such agreements, companies commit to accept animals only from suppliers registered under the Rural Environmental Registry (CAR) that have agreed both to refrain from illegal logging and to reduce deforestation where it is still permitted by the national forest code. But in practice most of the cattle is laundered: cattle are often reared on illegally deforested land and then are moved to legal, registered ranches prior to being brought to slaughter. Recent evidence suggests that the CAR may have been used to facilitate land grabbing by criminal gangs in Pará, the main cattle ranching state in Brazil. Landholders there are accused of having created false CARs to continue deforesting untitled lands. To add insult to injury, cattle ranching in the Amazon also involves high rates of labour conditions akin to slavery. Research has uncovered clandestine airstrips built by some large producers to transport heavy weapons and ammunition in addition to supplies for livestock production. Large ranchers, such as the Santa Bárbara Group in Pará, have been accused in several instances of having used slave labour on their premises, where many workers perform their duties under armed observation. This all spells trouble for Brazil’s struggling economy and for the lucrative agribusiness industry, one of the few relatively stable economic sectors in the country. It also disturbs beef packers’ market valuation, fostering the spectre of import bans on meat from Brazil. Even more importantly, it calls into question why the National Development Bank (BNDES) – which is funded by the Brazilian National Treasury out of tax revenues – leveraged JBS and BRF in their recent global shopping spree to buy out overseas market leaders. Finally, it also raises issues of BNDES’ legitimacy in its management of the Amazon Fund, the widely acclaimed national results-based payment mechanism for Reducing Emissions from Deforestation and Degradation (REDD+). The livestock sector’s contribution to global climate change is undeniable – GHG emissions are estimated to account for 14,5% of global total, more than direct emissions from the transport sector. If we take in account the indirect emissions from land use changes to account for the feed industry, then we are looking at up to 30% of total global. Its role in providing protein to feed us is equally self-evident. FAO says the world needs to produce at last 50% more food by 2050 and that global meat consumption will reach 460 million tones in 2050, an increase of 65% on 2009. Some of the projections are quite scary – China’s meat consumption could double by 2030, for example. What are the options, then, to respond to growing demand for meat while avoiding further deforestation, ranching-related GHG emissions and associated social costs? Is it possible to reduce GHG emissions while meeting the protein needs of a global population that is projected to swell by another two billion people by 2050? Recent analyses suggest that, without a shift in global meat and dairy consumption, it is unlikely global temperature rise can be kept below two degrees Celsius. Governments and environmental groups have proven to be reluctant to pursue policies or campaigns aiming to shift consumer behaviour. Knowledge on how best to reduce meat and dairy consumption is hampered by insufficient research funding. In addition, food choices tend to be shaped by taste, price, health and food safety, leaving climate change as a secondary consideration. Nevertheless, some of the greatest potential for behaviour change appears to lie in emerging economies such as Brazil, India and China. To curtail livestock expansion, associated deforestation and its contribution to GHG emissions, the most important source of pressure must come from the major slaughterhouses themselves, as well from beef buyers and importing countries that insist on certified origin, transparency and safe labour conditions. Unfortunately, the Brazilian government has been unable to build an adequate traceability system to identify cattle origin due to vested interests in the current, chaotic status quo. Landholders also resist attempts to increase transparency, given that cattle ranching is often a means for money laundering and tax evasion. But if importing countries, major buyers and the finance sector firmly demand to know where and how cattle were raised, transparency is bound to improve. For example, in response to the import requirements made by the European Union (EU), the Brazilian government enacted Law 12.097 in 2009, which demands traceability of the beef supply chain. Following EU requirements, the Ministry of Agriculture and the Brazilian Confederation of Agriculture and Livestock established a task force with the objective of developing, improving and maintaining a cattle breeding and rearing information system, including registration of rural properties, control of animal transport (Animal Transit Guide, GTA) and services toward productive chain traceability. This shows that Brazil will respond to international pressure. But the problem lies beyond external influence, since the tracking of individual animals still only exists ‘on paper’: it is expensive and far from the large-scale implementation needed for true transparency. Effective traceability is hampered by the fact that the GTA database is not publicly available (not even to the meatpacking companies) and the CAR database is poorly maintained and disconnected from the GTA data and from the federal agricultural management platform created to track cattle production. Meat consumers of the world, unite! Brazil is among the top 10 emitters of GHG emissions in the world, but Brazilians are not alone in driving Amazon deforestation. Nor can Brazil take sole responsibility for fixing these problems. Without addressing the chief driver of meat production – our consumption habits – we cannot radically reduce GHG emissions. Integrated crop-livestock-forestry systems, innovative technologies and awareness of other sources of protein are urgently needed. Better feed and breeding techniques may help. But food production factors must be considered jointly with consumption patterns: to link sustainable production with changes to diets. Indeed, the Paris Agreement recognizes the need to make both production processes and lifestyles more sustainable. Therefore, we call for more targeted research on consumers’ behaviour and values, awareness about protein futures beyond livestock intensification, publicity on the role livestock plays in driving climate change, shared responsibility between producers and consumers, and technology transfer. For consumers, the questions persist: Do you know where the meat you eat comes from and what is ‘at steak’? Isn’t it time to cut back on your meat consumption? Brazil has one of the most advanced deforestation monitoring systems in the world: the Program for the Estimation of Deforestation (PRODES). Implemented by the National Institute for Spatial Research (INPE), PRODES carries out satellite monitoring of deforestation in the Legal Amazon. Since 1988, it has been producing annual deforestation rates in the region, used by the Brazilian government to establish and enforce public policies. INPE also implements a Real-Time System for Detection of Deforestation (DETER) to promote in locu monitoring, and a forest degradation mapping system (DEGRAD). Government efforts to curb deforestation, particularly through command-and-control measures, are widely recognized as having played a key role in reducing deforestation, and Brazil has won international acclaim for curbing deforestation in recent years. True, the rate of deforestation in the Amazon has dropped by 71% since 2004. Yet the forest is still shrinking. Since 2012, deforestation has risen by almost 36%, mainly driven by a shift in the way forest lands are cleared. Previously, large swathes of the Amazon were clear-cut, leaving gaps in the forest that were easily detected in satellite images. But recent years have seen a rise in smaller patches of deforestation, highlighting the need for the federal government to increase monitoring in smallholder areas. Moreover, rates of forest degradation from selective logging, fire and fragmentation have remained high or are increasing in many areas, threatening the ecological functioning and integrity of many remaining areas of forest. Blaming smallholders for these changes, however, is shortsighted. It has been observed that areas dominated by large properties still account for most of the deforestation, suggesting that larger landholders may have adapted their behavior by clearing smaller, incremental patches of forest that fall below the detection limits of the DETER system. 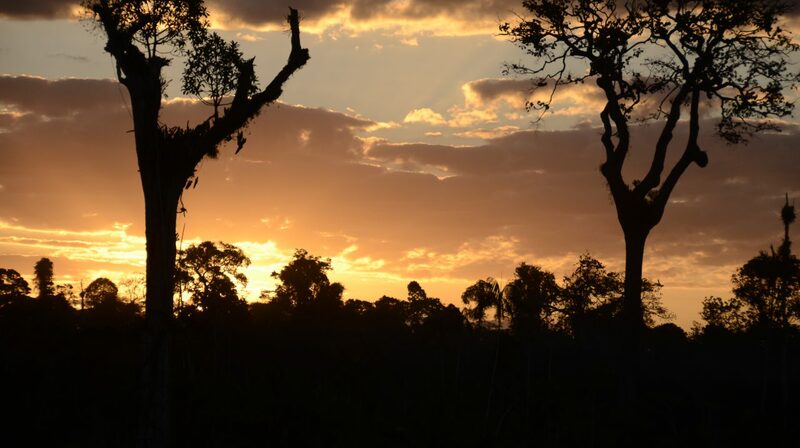 A recent study also suggests that, since PRODES monitors only primary Amazon rainforest (not dry forests or secondary rainforests) and excludes plots smaller than 6.25 hectares, it ends up treating these areas as non-forest. By comparing PRODES maps with satellite sources that measure canopy cover of all forest areas, the study authors showed that, while deforestation in large plots of primary rainforests has declined, it has expanded in areas not tracked by PRODES. Evidence from different sources suggest that deforestation in the Amazon has been tailored to avoid PRODES detection. But none of these explains how. During field research in the state of Pará – where some of the highest rates of deforestation in the Amazon are found – I observed that landholders have developed new methods for escaping satellite monitoring. For example, the ‘broken method’ (método quebradão, in Portuguese) is used to clear forest without fire or other techniques that are easily identified by satellite or in situ. Landholders leave around 20% of the forest area standing and clear the remaining trees either manually (in the case of smallholders) or by aerial spraying of poison over the canopy, causing trees to die in different stages (in the case of large landholders). In this way, the forested patches are not fully cleared, making monitoring by satellite difficult. Another way to ‘break the forest’ was recently identified by the Federal Public Prosecutor’s Office in Pará: landholders first demarcated by GPS the area they planned to deforest, then set up several logging camps tasked to clear the shorter trees first. With the larger trees left standing, the canopy appears complete in satellite images, masking the true deforestation beneath. These observations may help explain the significantly higher levels of forest degradation in areas dominated by large properties, where DEGRAD has identified small patches of deforested land as degraded. They also suggest that the increase in the number of small polygons in INPE’s deforestation data may be related to new deforestation methods adopted by landowners. This supports Richards et al. (2016) proposition that using INPE’s data to increase monitoring of forest loss in the Amazon may have incentivized landowners to deforest in ways and places that evade the monitoring and enforcement system. The authors also argue that PRODES-monitored deforestation no longer represents the full scope of deforestation in the Brazilian Amazon, and therefore has become less accurate as a component of the system Brazil uses to estimate GHG mitigation from avoided deforestation. Brazil is now facing one of the worst economic and political crises in its history. People in the Amazon would not expect controlling deforestation to be a priority under these circumstances. These adaptations on the ground show that enforcing rules is not a straightforward process, especially in Brazil. It also highlights the importance of tracking collective and individual feedback on policies and measures applied to complex situations such as governing forest landscapes. After all, humans are normally resistant to changing behavior, especially if change is imposed by others. Creatures of habit, we tend to focus on short-term gains rather than long-term, sustainable benefits. The ability of landholders to change their behavior also depends on the repertoire of elements (such as materials, know how, etc.) they have at their disposal. Moreover, at the heart of the behavioral change process is an awareness of the problem that needs to be tackled (i.e. deforestation). It is only when individuals perceive the problem as urgent and worry about its negative consequences that they will consider acting. If Amazonian landholders are convinced that mitigating climate change by reducing deforestation is not their responsibility, believing instead that people in urban centers are solely responsible for modifying their behavior, they will not change their own. Thus, it is critical to tailor deforestation-reduction policies to local needs, and to consider the possible local adaptations being implemented by landholders to evade enforcement. But given this week’s announcement of draconian austerity measures whether the Brazilian federal government will give the necessary attention to these issues become less uncertain at a time when democracy itself has been thrown under the bus. How many people will need to die before we really open our eyes to forest destruction? Last month, an inspiring forest defender was brutally murdered in the Brazilian municipality of Altamira, Pará. Luis Alberto Araujo, former environmental secretary for São Felix do Xingu, was killed in his car as he and his family pulled into the driveway of their home. Araujo was the secretary for the environment on the city council of Altamira, recently leading efforts to improve urban sanitation. He was also responsible for getting properties registered under the Rural Environmental Registry (CAR), especially in areas that have been traditionally resistant to registration. He was making a difference in the fight against high deforestation rates. While in São Félix do Xingu, where he worked between 2009 and 2012, Araujo was responsible for implementing the Municipal Pact to Reduce Deforestation. During his mandate deforestation levels decreased sharply in São Félix, and his tenure was marked by impartiality and a strong drive to implement environmental legislation. People like Araujo have made a significant impact in stopping the unsustainable exploitation of forest resources. But many risk their lives to do so. Despite this, the international environmental community has so far paid little attention to the human rights abuses that intersect with forest protection. In 2014 at least 116 environmental and land defenders were murdered – nearly double the number of journalists killed over the same period. While there are several international campaigns to prevent the killing of journalists, there is little public awareness of, and pressure to end, the killing of environmental defenders. How many more need die?